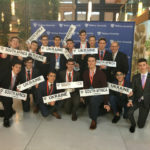 Mazal Tov to MTA Freshman Binyamin Fox, who beat the odds to win an Honorable Mention for MTA in this year’s Yeshiva University National Model United Nations (YUNMUN) conference. Binyamin, who represented Ukraine, had worked incredibly hard to prepare for the conference and won, which is highly unique as a Freshman win is rare. Kudos also to MTA YUNMUN Co-Captain Ari Kimmelfeld, who, also representing Ukraine, taught his committee a Ukrainian Chassidic song and was called up to sing it for the entire conference. Congratulations to the entire team for all of their hard work in preparing for the conference. MTA Delegates worked diligently during the conference itself and participated in a multitude of activities, including UNESCO committee meetings, a debate regarding solutions for the Zika virus, preparing working papers on behalf of the UN Human Rights Council and resolutions for the UN Office on Drugs and Crime, lobbying for the peaceful use of outer space, advancing South Africa’s interests in the International Maritime Organization, and hearing arguments as members of the International Criminal Court.